• Between July 2016 and July 2017, the city of Rio de Janeiro reported 3,829 shootings. • The neighborhoods of Costa Barros, Acari and Cidade de Deus are the ones with the largest number of municipal and state schools and daycare centers exposed to armed violence. • A large part of the incidences of shootings/gunfire are concentrated in the North Zone, mainly in the regions of Complexo do Alemão (218 reports) and Maré (119 reports). Another area that draws attention is the vicinity of Avenida Brasil, near the neighborhood of Penha (128 reports). The problem of violence in Rio de Janeiro is structural and affects the quality of life of its citizens unequally, that is, there are areas concentrating more shootings than others, influencing the way people experience the city. In addition, the degree to which violence potentially affects people depends on proximity to the incident and on the age of the person in question. The closer to the violence and the younger the person, the higher the perverse effects of the exposure to violence. Therefore, the population in a condition of social vulnerability is affected in a disproportional way by this structural condition, which has consequences for their potential to develop skills, particularly for school-age children and teenagers. From a point of view of providing adequate public services to the population, particularly school-age population, the situation of violence requires continuous acting by the State in order to mitigate the perverse effects caused by this exposure. Elaborated by FGV/DAPP from data collected through the application Fogo Cruzado, the aim of this Policy Paper is to contribute to the elaboration of public policies that will meet the various needs of school-age people who live in vulnerable areas with high rates of violence, especially of the armed type. Such policy is a way to demand from the State its role in equating the social differences that are caused by the public safety crisis. The document is divided in four parts. The first one deals with the issue of violence as a multidimensional problem, which affects the quality of life and the development of the population. The second part contextualizes the issue of violence in a debate of social justice and explains why, in acting to mitigate the perverse effects of violence, the State is reducing inequalities. The third part presents an analysis of data on shootings/gunfire and on public schools in the city of Rio de Janeiro in order to elect priority areas for action. The fourth and last part presents suggestions of public policies to better serve the affected population. The daily life of the carioca population is affected constantly by episodes of violence. According to information from the Institute of Public Security (Instituto de Segurança Pública – ISP), in the year of 2016, more than 6 thousand people died violently in the state, averaging one violent killing every 90 minutes. This dynamic of violence is also perceived in the city of Rio. Up until May, more than 500 violent killings had already been accounted for, according to ISP. However, it is important to situate these deaths and highlight the impact of this violence on the lives of state-school students. In February, more than 20 schools located at Complexo da Maré had their classes interrupted. This episode was repeated in March, causing 14 schools in the location to suspend the classes. The result was that more than 10 thousand students had their classes paralyzed in these two months. Added to that are the grave episodes of violence that resulted in the deaths of children and teenagers inside educational institutions, or even close to them. The case of Maria Eduarda, shot inside her college in Acari and killed at thirteen years old, precisely illustrates the current scenario of unsafety in Rio. In this panorama, there is no doubt about the need for structural policies capable of reverting the situation of unsafety and violence in Rio de Janeiro. However, in addition, it is also necessary to take into account the impact of violence on the learning process and its short-, medium- and long-term effects. Therefore, we expect from the State the capacity to conceive public policies that are geographically focused and that cover the issue of public safety as a multidimensional theme. In this sense, the answer to this question involves a myriad of policies that do not mobilize exclusively safety professionals, but also includes professionals from the fields of health and education. It is a hard task to isolate the effect of violence in the development of children and teenagers from other social factors. That is because, in general, violence is part of a reality that is associated with other factors known to influence the development of skills by part of the individuals. For example, it is a known fact that there is a relationship between the development of skills and the educational level of the parents, or with the family income. It is also known that physical proximity to violent events increases the perverse effect that its exposure causes on children and teenagers. That is, the closer the violent event is to children, the higher the probability that they present negative symptoms caused by this exposure. Therefore, being a direct victim of violence in the community where one lives, as opposed to witnessing violence, results in more observable perverse effects. In a less consistent form, the effects are also perceived according to age: younger children present stronger signs of depression when exposed to high levels of violence in the region where they live. More specifically, there are comparative reports that relate the performance of the same group of children before and after exposure to violence, and present indications of change in their capacity to concentrate and control emotions in the period after the exposure. It is consistently reported that children and teenagers can develop similar behavior to that of post-traumatic stress disorder (PTSD) after exposure to violence. The symptoms traditionally associated with PTSD affect cognitive processes, such as memory, the capacity to maintain attention, to plan and to solve problems. Additionally, it gives rise to social interaction problems between pairs, since exposure to stressful situations can affect the volume of the hippocampus, the area of the brain associated with the capacity to control emotions. 2. the selective attention, or the capacity to assign attention to an emotional stimulus. These skills directly influence the capacity of children to absorb stimuli and information. This situation is already worrisome when it happens a single time, considering these skills are essential in a classroom environment. The case becomes aggravated when there are repeated exposures to violence throughout a year, which can ultimately affect the development of skills among children, even if they are subject to the same stimuli. We observe that the areas where shootings happen are areas in a context of social vulnerability. Therefore, school-age children and teenagers who live in these areas are doubly penalized when it comes to the development of their skills. That is because children in a vulnerable situation are generally not subject to the same quality or quantity of stimuli over the course of their lives. They are generally less subject to parental practices of reiteration of social interactions related to performing tasks and, frequently, they start school with less guided reading hours accumulated. This causes a direct impact on the skills developed by children, even before they reach school age. The problem is aggravated with exposure to violence, which affects the capacity of learning and absorbing information by the students due to the ramifications of its perverse effects on the development of cognitive and socio-emotional skills. In addition to, on average, experiencing a lower number of situations of positive stimuli, children and teenagers in vulnerable conditions are also subject to chronic exposure to stressful situations, such as the cases of shootings and constant gunfire. Considering this scenario, the diagnosis is that children who are born in families and/or in areas of vulnerable situation are disadvantaged from the start of their lives, and the trend is for the hiatus of development to increase over time, eventually becoming irreversible. Considering that children who live in areas at risk are generally exposed to different stimuli both in quality as well as quantity; knowing that the stimuli explain the differences in the development of cognitive and socio-emotional skills and that these differences are already noticeable at 18 months of age; considering also that, in the process of child development, skills are auto-reinforced, that is, the more skills a child has, the more likely he or she is to develop new skills, since these differences in skills not only persist over time but also tend to grow; we advocate in this document that carrying out interventions through public policies in areas susceptible to violent events must be a priority, especially from a point of view of social justice. The idea of social justice can be understood as a concept based on equal rights in a given society. In this sense, justice, including its social facet, should be understood as a synonym of equity. Therefore, each member of the society should have the same rights and access to an adequate set of equal basic liberties. Consequently, equality is related to equitable opportunities for all and, in that case, the State must take on a role of protagonism, offering the most benefits to the least privileged members of the society, guaranteeing an environment of social cooperation. Considering this notion of social justice, we can see how violence becomes a barrier to the access to certain basic liberties and impedes the adequate access to equal opportunities. In the case of schools situated in areas of conflict, for example, the students from the community exposed to violence are deprived of the educational experience or have its quality affected, while students situated in locations without conflict enjoy unimpeded access to education. However, this does not mean that the residents in areas of conflict must frequent schools in regions with lower exposure to violence, but that they have the same rights to safe education. What we expect is a State that is engaged and capable of developing adequate public policies for the population in vulnerable regions, which means adequately investing on the instruction of professionals able to work in these vulnerable locations and capable of developing actions adapted to the daily lives and needs of the children exposed to violent situations. Violence is a factor that affects child development in such a way that its effects persist over time. This makes it urgent for the public authorities to serve specially the school age population exposed to violence in the city. In order to elect priority areas for action, FGV/DAPP and Fogo Cruzado georeferenced the data gathered on shootings/gunfire in the city of Rio de Janeiro, the information on daycare centers and public network schools and the rates of violent lethality. Our goal was to elect priority areas for action through public policies to mitigate the long-term effects of exposure to violence and its impact on the development of skills and on the capacity of individuals to fulfill their own lives. (2) the number of shootings/gunfire only. Regions that concentrate a large number of schools and have armed conflict must be under constant vigilance, given the large number of people affected by armed violence. In turn, schools located in areas with numerous reports of armed violence need public policies focused on the persistence of the symptoms caused by recurring exposure to violence, even if these areas do not have the same concentration of schools than other areas. This systematized information indicates priority areas for articulating public policies focused on children and teenagers who live in environments that are more susceptible to violent situations and, because of that, have their development opportunities impaired. In the city of Rio, from July 2016 to July 2017, 3,829 shootings were reported. The following heat map shows the concentration of armed violence in the North Zone and partly in the West Zone, indicating neighborhoods surrounding the spots as priority areas for action. In addition to the previous map, which delimits incidences of gunshots, it is noteworthy to mention the fatalities from these shootings/gunfire events in the city of Rio, as follows. Therefore, we notice a higher concentration of fatalities due to shootings/gunfire in the zones North and West of the city of Rio de Janeiro. As can be observed, the number of shootings with no fatalities is lower than the ones that caused deaths. In addition, when observing the georeferenced information on daycare centers and public schools in Rio, as follows, we notice an overlap between these pieces of information, which means there is a high concentration of schools and daycare centers in vulnerable areas, confirming the need for public policies focused on these priority areas. A large part of the occurrences is concentrated in the North Zone, particularly in the regions of Complexo do Alemão (218 reports) and Maré (119 reports). In the area of Complexo do Alemão, according to the most recent data available from ISP, 21 people were killed violently between July 2016 and May 2017, the most recent data available. In the region of Maré, in turn, 122 people were killed violently in the same period. Another area that draws attention is the vicinity of Avenida Brasil, near the neighborhood of Penha. In this location, 128 reports and 71 violent killings were accounted for. The neighborhoods of Maracanã and Mangueira and Lins also reported high numbers of shootings/gunfire in the region: 104 and 101, respectively. In addition, in the region of Mangueira, 34 violent deaths were accounted for, and 18 in the region of Lins. An alarming fact is that, out of the 104 shootings in the neighborhoods of Maracanã and Mangueira, 72 happened in Mangueira alone, precisely in the region known as Parque Candelária, were there are two municipal daycare centers (Creche Municipal Eduardo Moreira dos Santos and Creche Municipal Homero José dos Santos) and one municipal school (Escola Municipal Mestre Waldemiro). Another alarming region of the city of Rio de Janeiro is the West Zone. 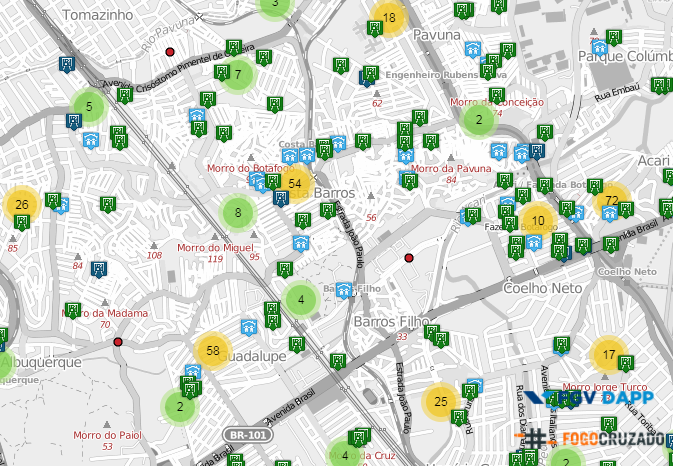 159 shootings were registered in the neighborhood of Cidade de Deus alone. In the neighborhood of Bangu, 63 occurrences near schools were reported. Regarding violent killings, 81 deaths were accounted for at Cidade de Deus, and 133 at Bangu. The neighborhoods of Costa Barros and Acari are the ones that concentrate the largest number of municipal and state schools and daycare centers exposed to armed violence in the city of Rio de Janeiro. Regarding the number of reports of shootings/gunfire, it can be said that it is a region in critical situation. In Acari alone, there were 72 reports of shooting/gunfire, followed by Costa Barros, with 54 occurrences. These numbers, when contrasted with the large quantity of educational institutions in the surroundings, intensifies the impact of violence in the daily lives of the students. Added to this context, 188 violent killings were accounted for in this region. It is noteworthy to mention that the maps that represent shootings/gunfire reported in the city of Rio de Janeiro in this period present the data in clusters, that is, in groupings of dots that reflect the quantity and reach of each event. If, for example, a neighborhood accounted for 50 occurrences, the maps would not show 50 dots, but a joint representation of these 50 dots. It is important to emphasize that in this visualization the clusters were classified as low occurrence (the groupings appear in a green circle), medium occurrence (the groupings appear in a yellow circle) and high occurrence (the groupings appear in an orange circle), thus reflecting the quantity of occurrences. This document presented a georeferenced analysis of the situation of armed violence in the city of Rio de Janeiro between July 2016 and July 2017, together with a mapping of public schools in the city. Since exposure to violence causes lasting effects and directly affects the life possibilities of the citizens, FGV/DAPP, in partnership with Fogo Cruzado, identified urgent areas in order to direct the actions of public authorities to mitigate the damage caused. Both the data from Fogo Cruzado and governmental data show that, despite it being spread out around the city, there is a significant concentration of violence in the North Zone and in areas of the West Zone. Removing schools in these areas is not an adequate answer to this situation, for two main reasons. First, because children and teenagers live in the communities where these schools and daycare centers are located. Even if the public schools were to be removed, the problem would remain and these children would continue to be exposed to the situation of violence when returning to their homes. Therefore, they would continue to suffer the adverse effects of violence, which in turn has a direct impact on their learning and skill development capabilities, compromising the life possibilities of these children and teenagers. Second, because removing these schools from the place they are located affects the autonomy of the population who frequent these institutions, now requiring that caretakers make a journey which was, until then, not necessary, reducing the possibilities of activities which those in charge of transporting these children can engage in during school time. Complement the actions with tending to the families who reside in the identified areas, with a home program aiming to instruct parents and caretakers of the affected children. The agenda of propositions above seeks to mitigate the adverse effects of exposure to violence in school-age children and teenagers, emphasizing the multidimensionality of effects involved in the public safety agenda and favoring a perspective of prevention and damage reduction. Considering the reality of Rio de Janeiro, these policies must be applied progressively and continuously to the entire city. Still, from a perspective of social justice, the present study, working with georeferenced data on armed violence, indicates the urgent priority areas for action. Fowler, et al., 2009 . Hayes, VanElzakker and Shin (2012). McCoy, Raver and Sharkey (2015). cortex and its capacity to communicate with other areas of the brain (RAVER 2003). Heckman 2006; Cunha and Heckman (2007). determinant for the development of new skills. Heckman 2006; Cunha and Heckman (2007). bodily injury followed by death during the time between July 2016 and May 2017. This number refers to data for the city of Rio de Janeiro with verified and validated addresses. violence in the city in 2017 covered only data up to May at the moment of concluding this research. in this year’s first trimester. For the analysis of the reports of shootings/gunfire, we used data from Fogo Cruzado, a collaborative platform whose goal is to measure the incidence of armed violence in the metropolitan region of Rio de Janeiro. The data is composed of notifications sent by users through a phone app. Before being posted, the notifications are verified by local collaborators and also the information is screened using special filters for social networks. Besides the user collaboration, the platform also collects data from the media, police channels – such as the daily bulletins on the website of the Military Police of the State of Rio de Janeiro and its social networks -, and local communication networks. 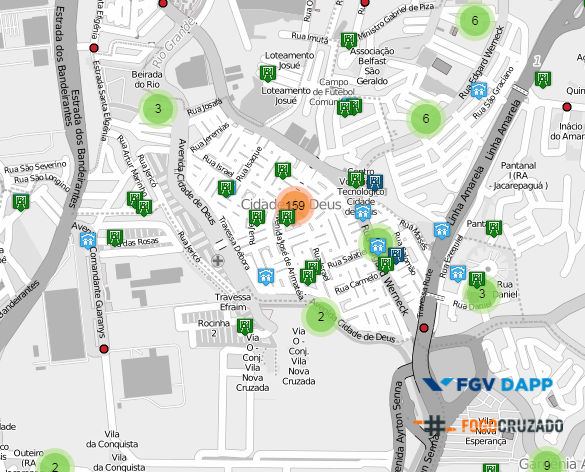 FGV/DAPP filtered the data obtained from the platform Fogo Cruzado, removing duplicate reports or with addresses outside the coverage of the application. Next, the data was fed into a georeferencing software in order to circumscribe the locations inside the limits of the city of Rio de Janeiro, eliminating the ones located outside of the city. In order to check whether the geographic coordinates were correct, we carried out a manual inspection of addresses in a small sample of data on shootings. BANCO MUNDIAL. World Development Report: Mind, Society, and Behavior. The World Bank: Washington, 2015. CUNHA, F; HECKMAN, J. The Technology of Skill Formation. American Economic Review, v.97, n.2, p. 31–47, 2007. INEP. Instituto Nacional de Estudos e Pesquisas Educacionais Anísio Teixeira. Censo Escolar. Brasília: MEC, 2015. RAWLS, J.; KELLY, E.. Justice As Fairness: A Restatement. Cambridge, Mass: Harvard University Press, 2001. XIMENES, L. F.; OLIVEIRA, R. V. C. de, ASSIS, S.G.de. Violência e transtorno de estresse pós-traumático na infância. Ciênc. saúde coletiva[online]. 2009, vol.14, n.2, pp.417-433. ISSN 1413-8123. Disponível em: http://dx.doi.org/10.1590/S1413-81232009000200011.